Gotta love a good before shot! Can you believe this room?! haha! This was actually the only room in the house that already had no carpet and just the original wood flooring, which made it automatically better than every other room. But this wallpaper! It was like 100 years old! Maybe only like 50…I’m not sure. But it was old. It almost had a painted look to it. It was actually kind of cool..except that it was so ugly. The same wallpaper (not same design, but same age/style) ran through most of the rest of the original parts of the house. Can you believe how different this whole space is now?! 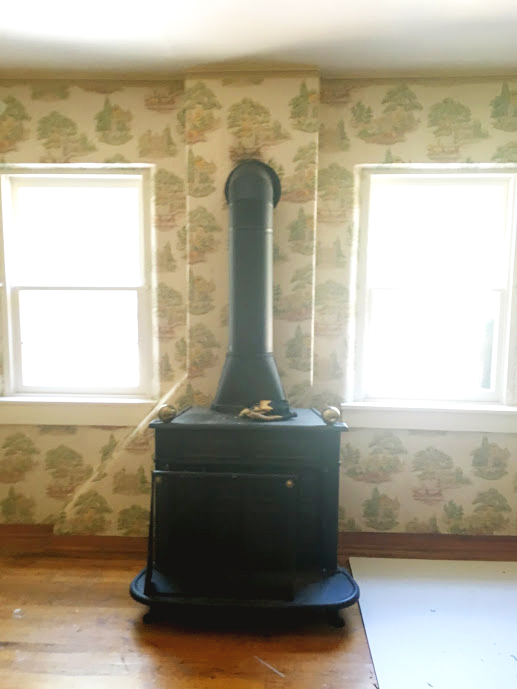 When I first started this project, I did a bunch of research into cleaning wood burning stoves. The recommendation I found was to use a vinegar/dawn/water solution. DO NOT DO THIS. I tried to prime and paint over it but the rust spots just came through, even through 3 layers of paint as you can see in the picture. So then I spent a bunch of time researching how to paint rusted metal. Which was actually so hard to find any useful information! I could not find anything similar to what I was doing. Eventually I just decided to go see what I could find at Home Depot. 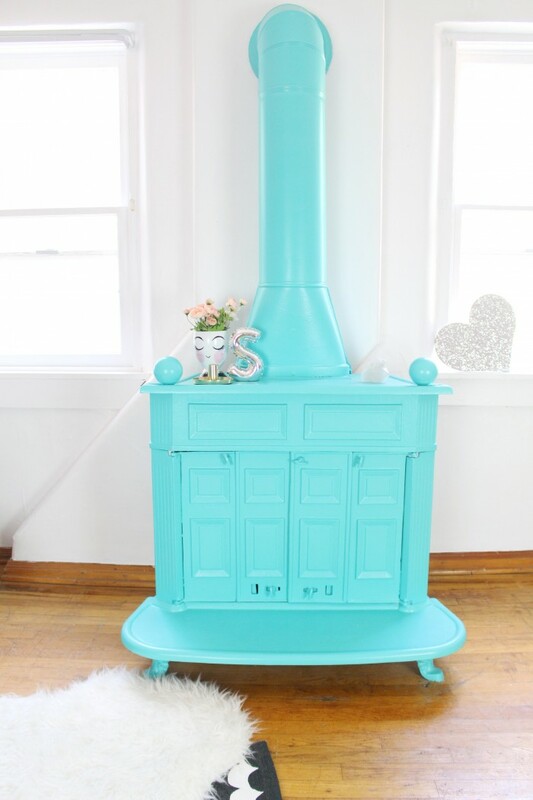 Once I saw the Rustoleum, I knew that was the answer! 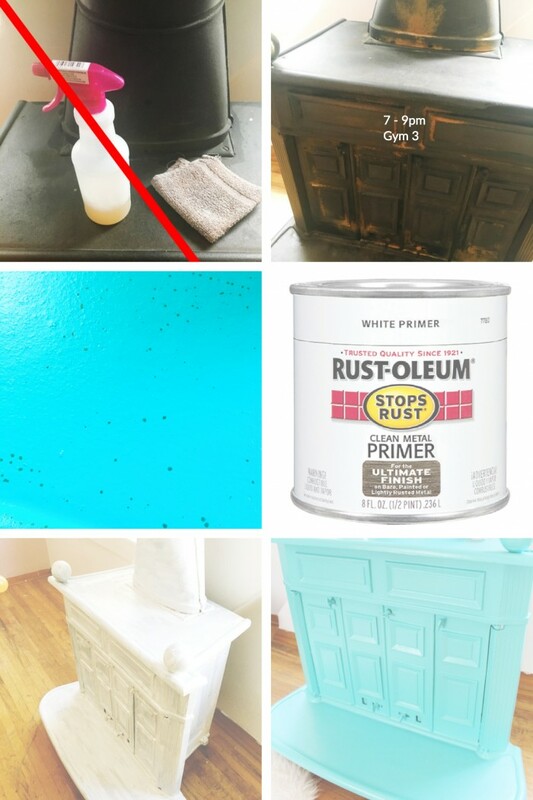 I am a huge Rustoleum fan. Their spray paint is hands down the best. And with RUST in the name, I felt like it was a good sign. There was a clean metal primer and a rusted metal primer. The clean metal one said “for lightly rusted metal” on it so I felt it would do the job. I think the other primer wasn’t white so I really didn’t want it. By this point I was feeling quite discouraged, wondering if I’d ruined this stove forever since the rust had come through 3 layers of paint and regular primer. But the Rustoleum came through! This stuff STINKS. But it works! Not a dot of rust came through it. I believe I did two coats just to be sure. But make sure to ventilate, this smell cannot be good for you. 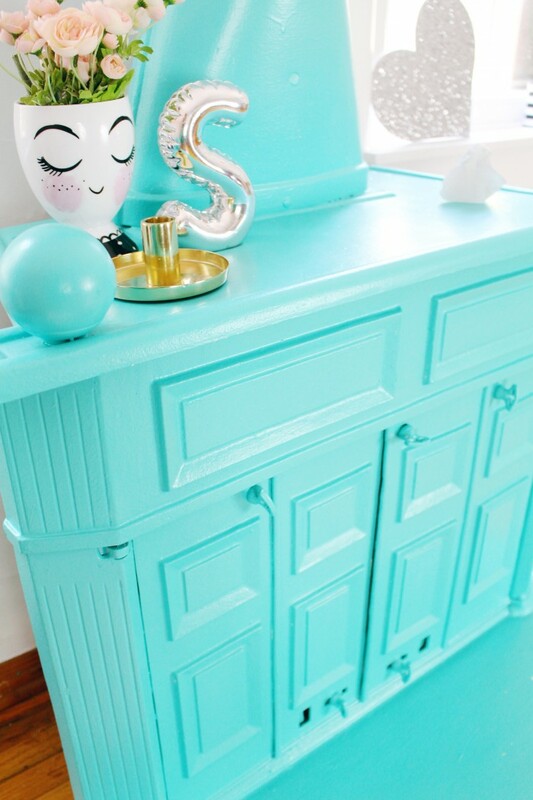 Then just paint your chosen paint color over the top. I also did two coats of this. So in summary-just dust your stove, do not clean with chemicals or water. Prime with an oil-based primer like Rustoleum, not a water based one. And then paint your chosen color! 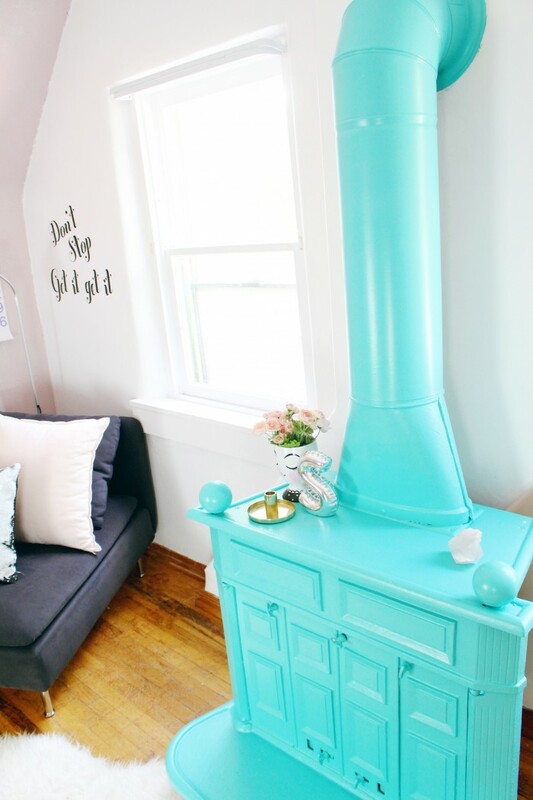 That’s all there is to painting an old wood burning stove. Its not complicated, it just took some trial and error for me. Really happy with this project. 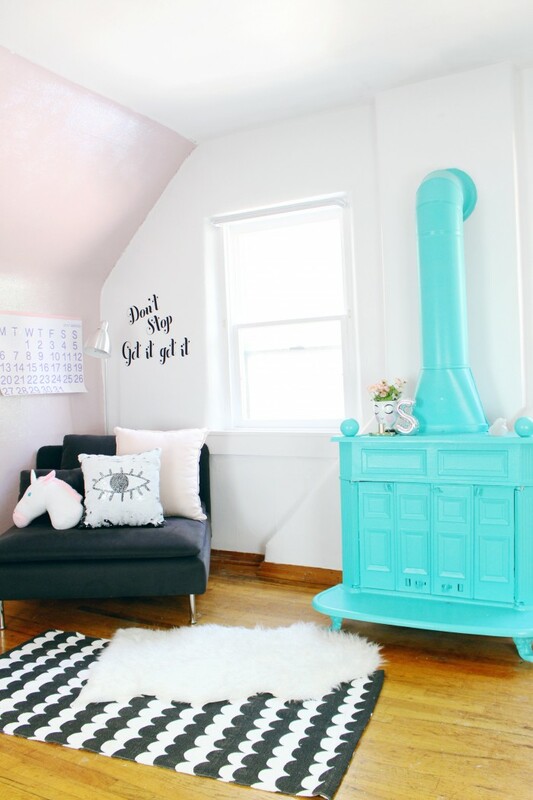 It is everyone’s favorite part of this room, it really pops when you walk in! Do you have a fixture like this you’d like to update? Are you too scared to do it? I figure the worst case scenario (like in a survival situation and we need the stove), it will probably still work, the paint may just come peeling off or smell or something. But I don’t think it’ll kill us…haha, reassuring I know! 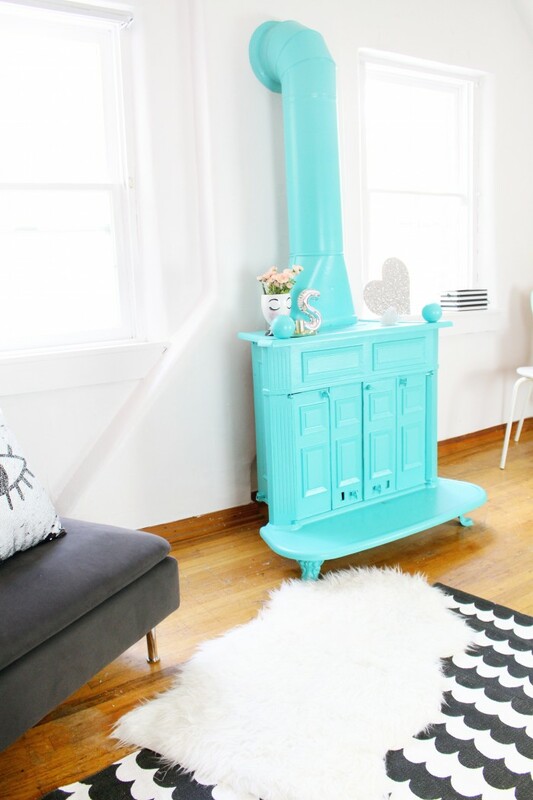 wow, you made the wood burning stove design creative. your detailed post helped me to be creative. thanks for your nice idea.